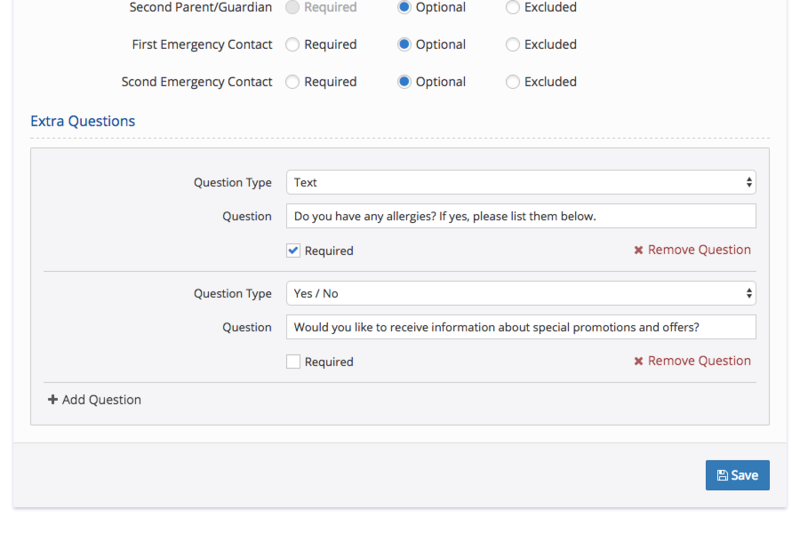 Clients can browse through the various programs and activities available for selection. 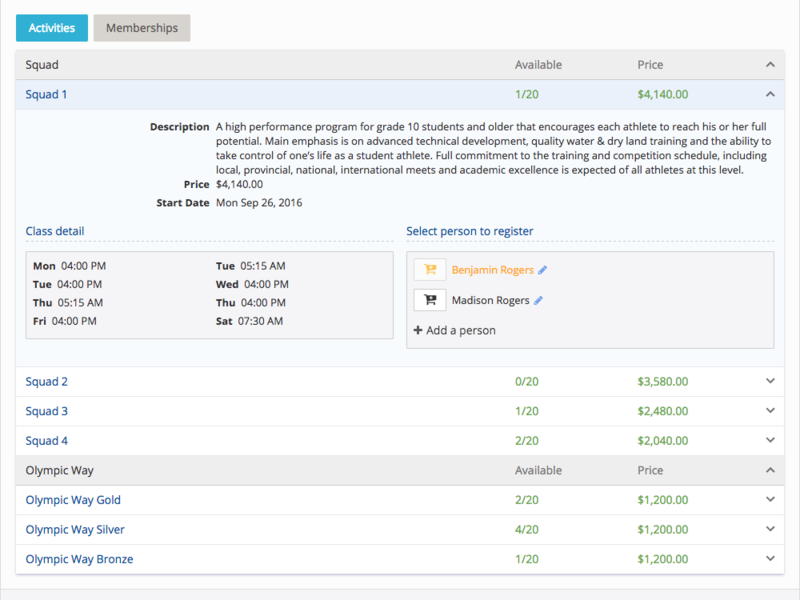 Information about the activities are displayed, including activity descriptions, class details and times, price, start dates, and more. 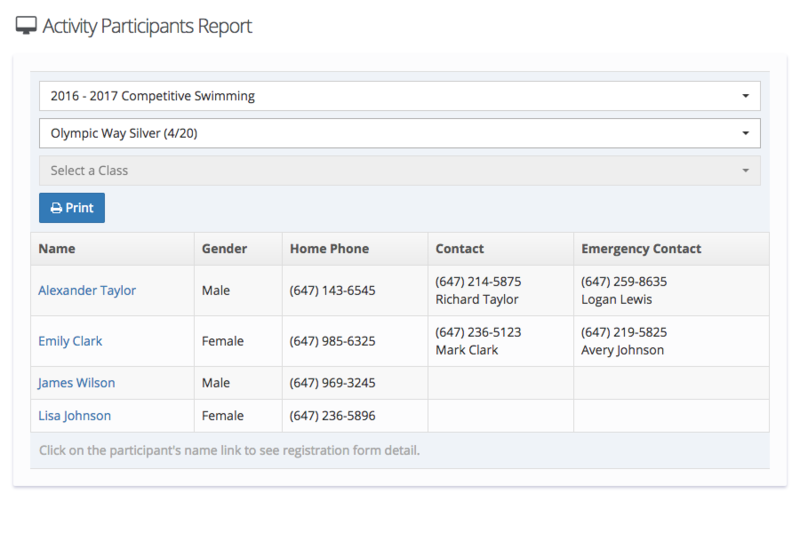 After registering for one or more activities for the participants, clients fill out a form providing basic information, such as contact details, address, parents, and emergency contacts, for each registered participant. 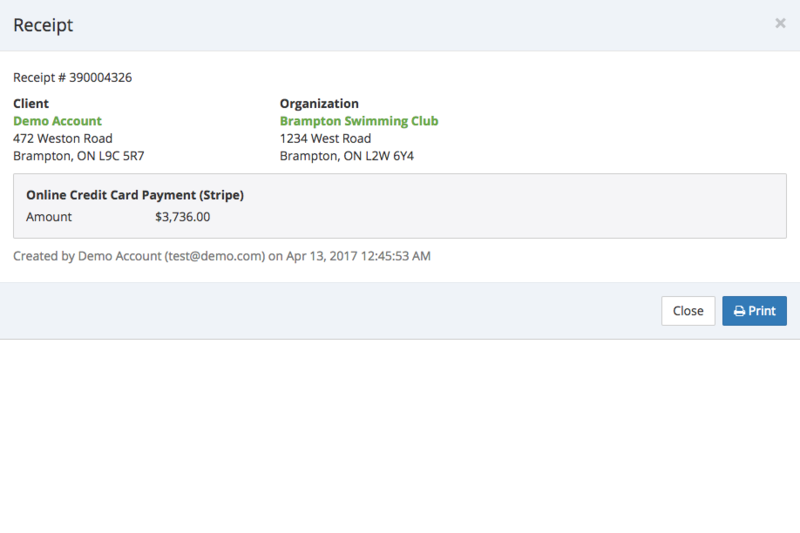 Based on the payment settings for the program, clients either pay offline, online via credit card through Stripe, in installments, or provide a deposit. Any promotions, extra fees, and taxes are applied at this time. 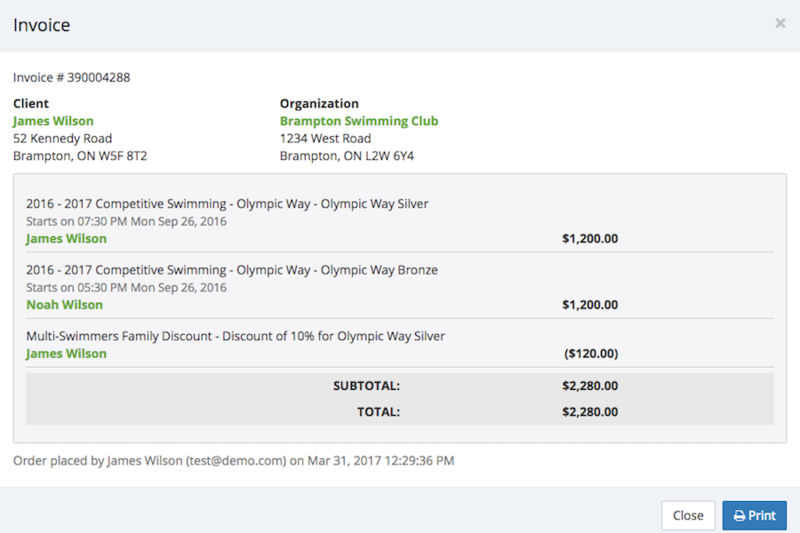 After the transaction is complete, clients receive an order confirmation that summarizes the details of the transaction. For convenience, a copy is also emailed to them. 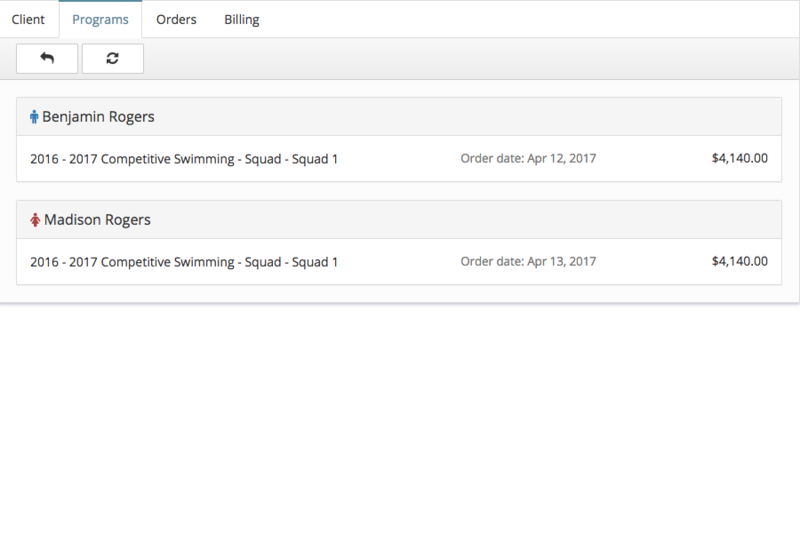 They can print the order summary or continue shopping. 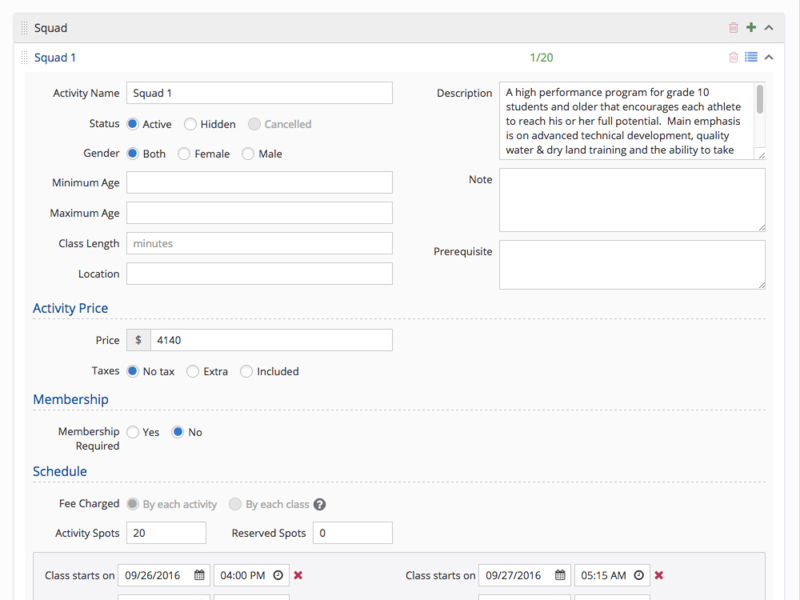 Administrators can create programs, which contain activities for clients to select and register. 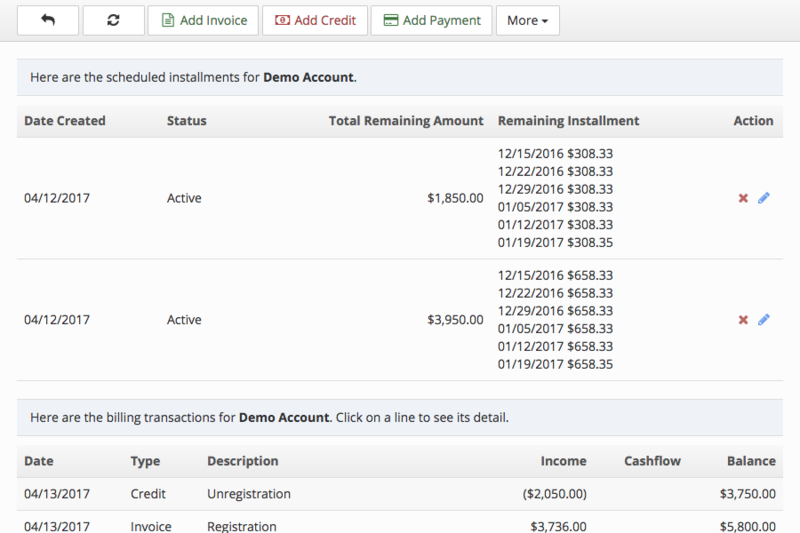 Program options, such as registration fee, registration period, payment settings, and messages to client, are set at this time. 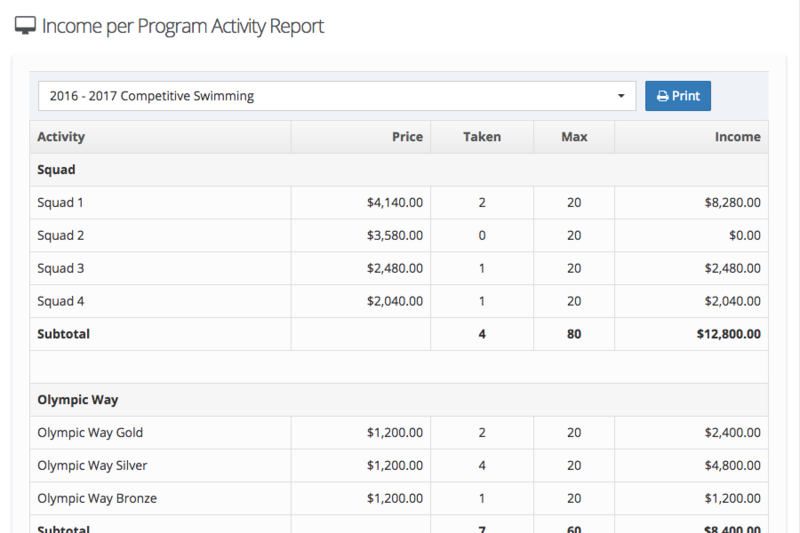 Each program contains multiple activities, which can be subdivided into categories. 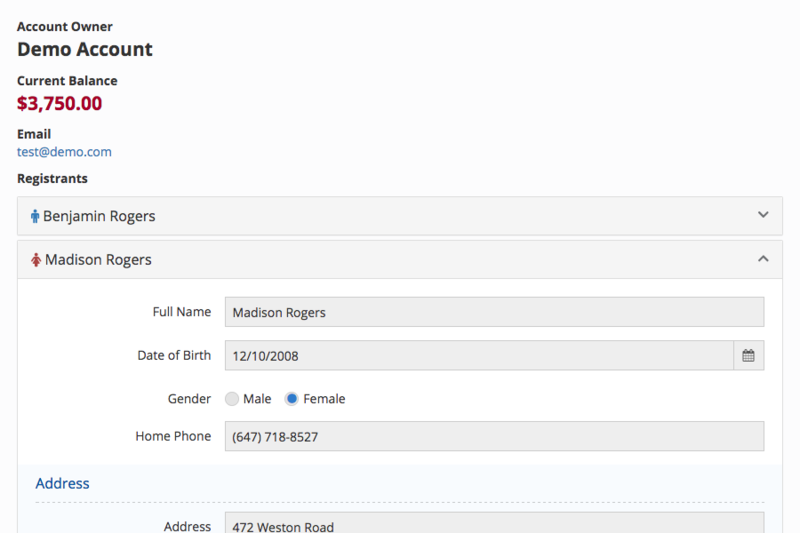 Provide details about the activity. 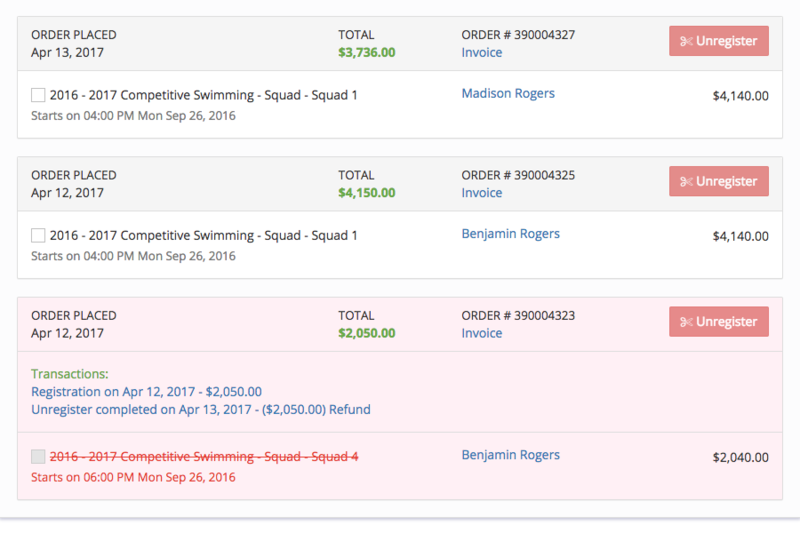 Fees can be charged either by the activity or by the number of classes selected for the activity. 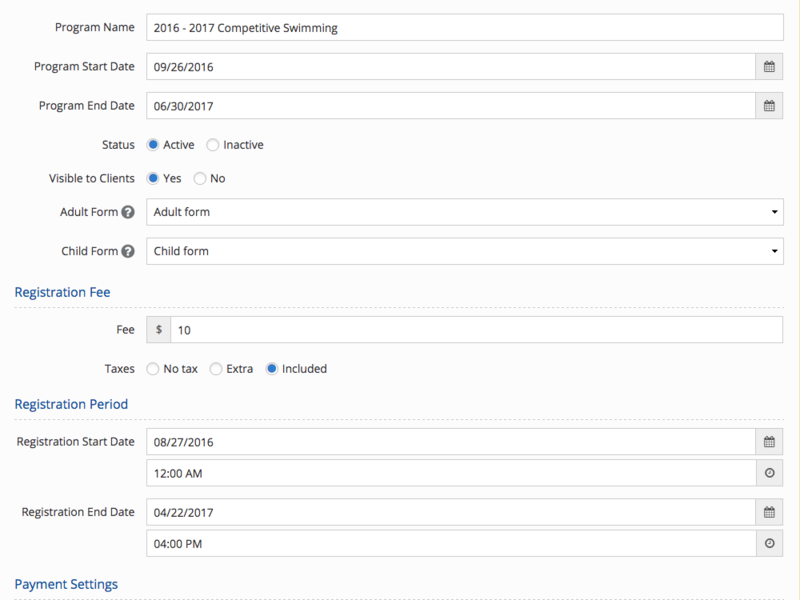 Administrators can create memberships with fixed dates or fixed durations, which are available for clients to purchase. 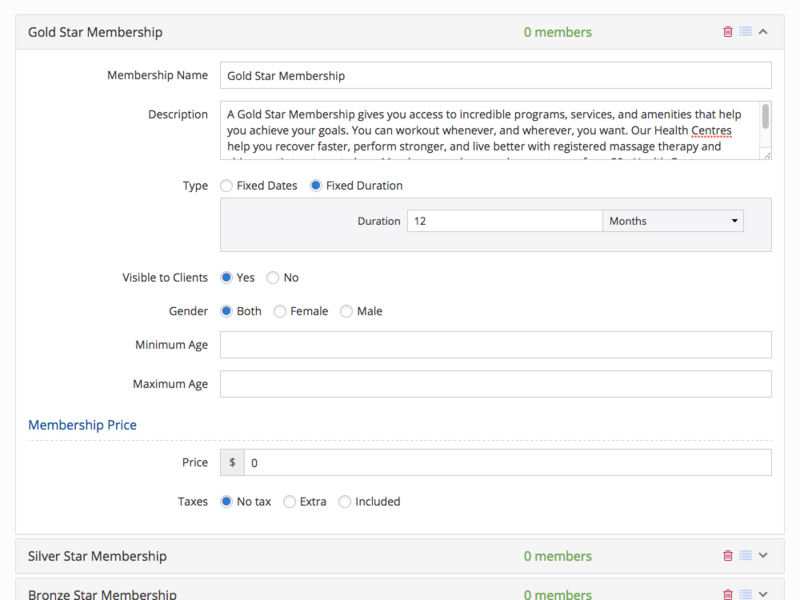 Members can receive promotions on various activities, defined in the promotion section. 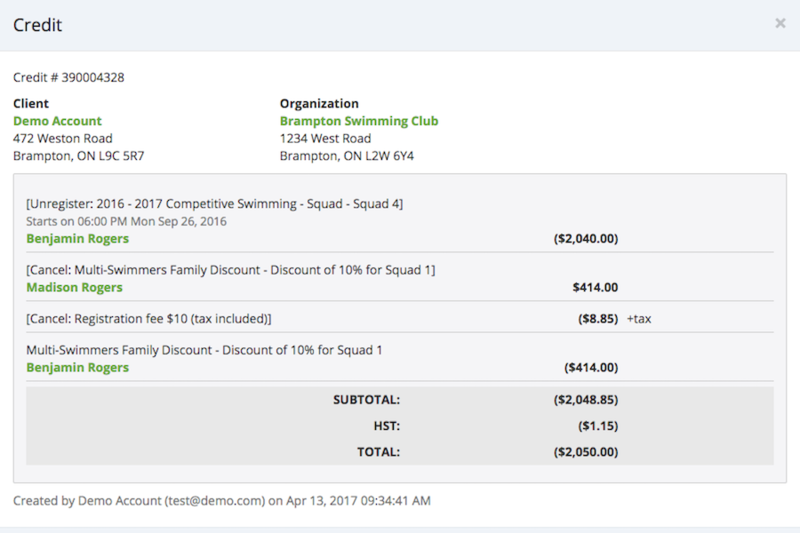 Many promotions are available, including early bird, age, location, and membership promotion, as well as promotion codes and discounts for multiple activities or persons. 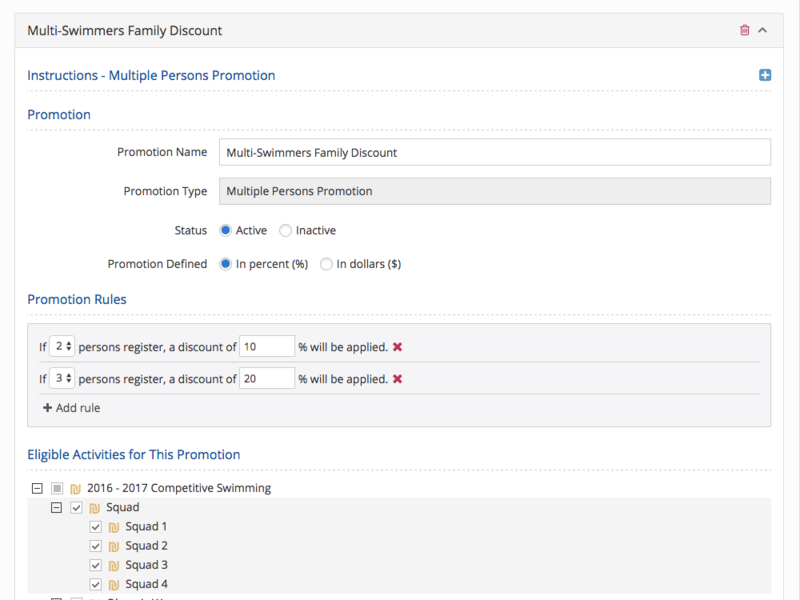 Promotions can be applied to any activity. 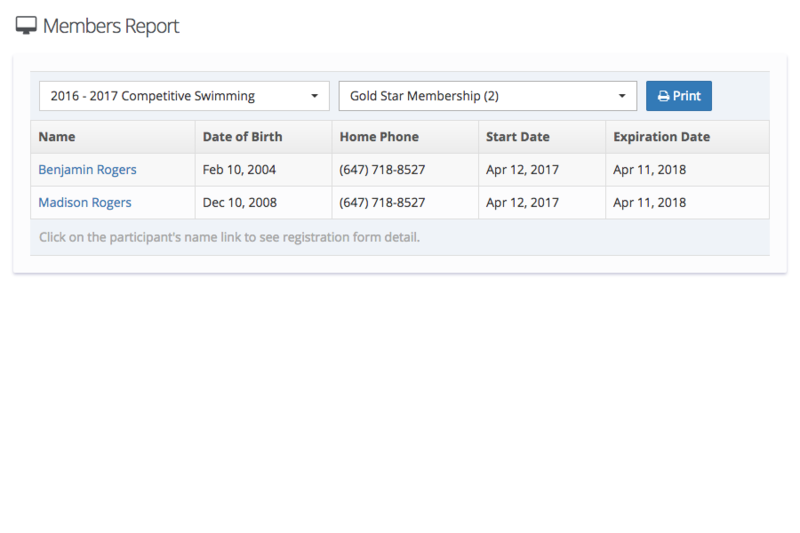 All client information is organized to allow easy access and management of your club. 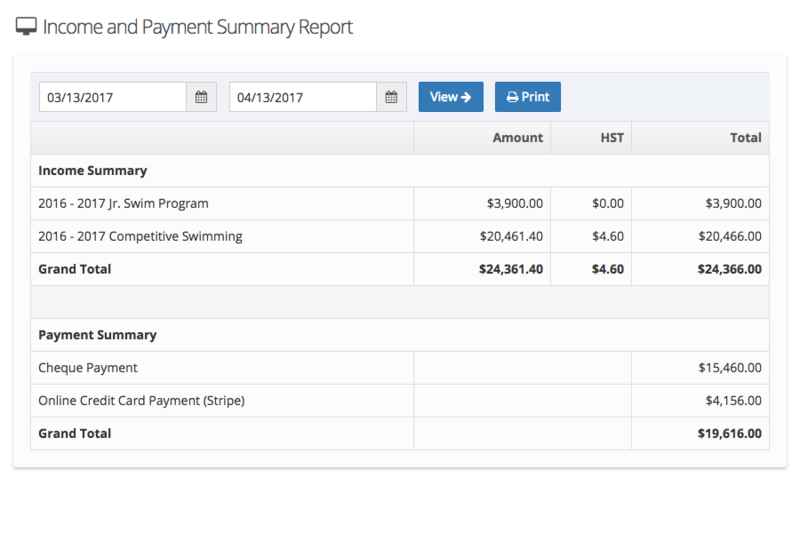 Easily view basic client information, registered programs, placed orders, and billing transactions. 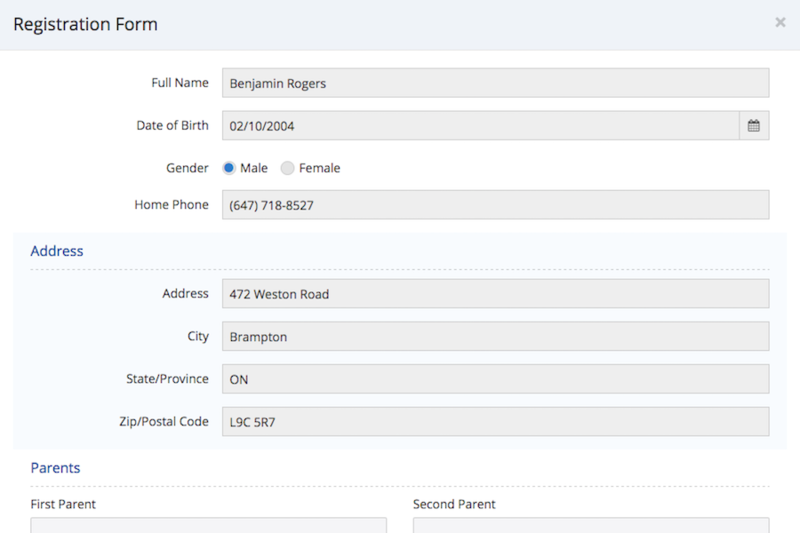 Create custom registration forms for adults and children. Additional questions or explanations can be easily included. 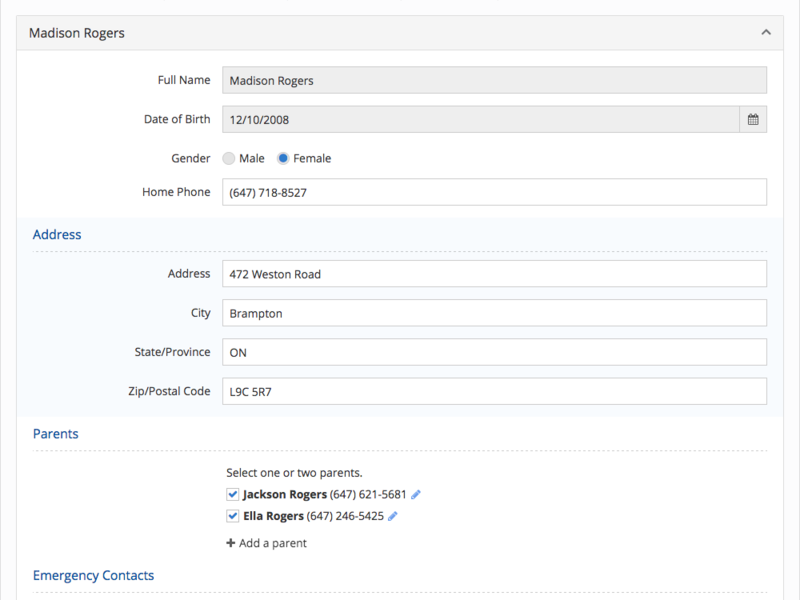 Client registration forms can be accessed from the client profile. 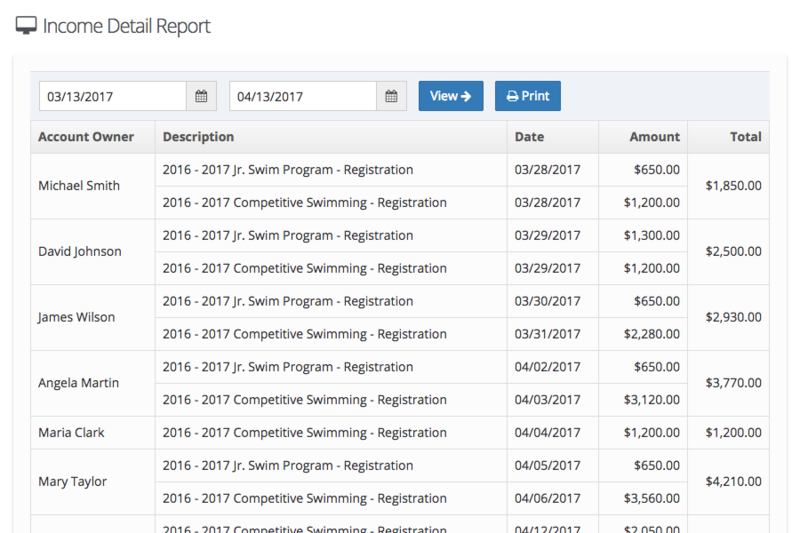 Save time and money on administration by generating printer-friendly reports in one click. 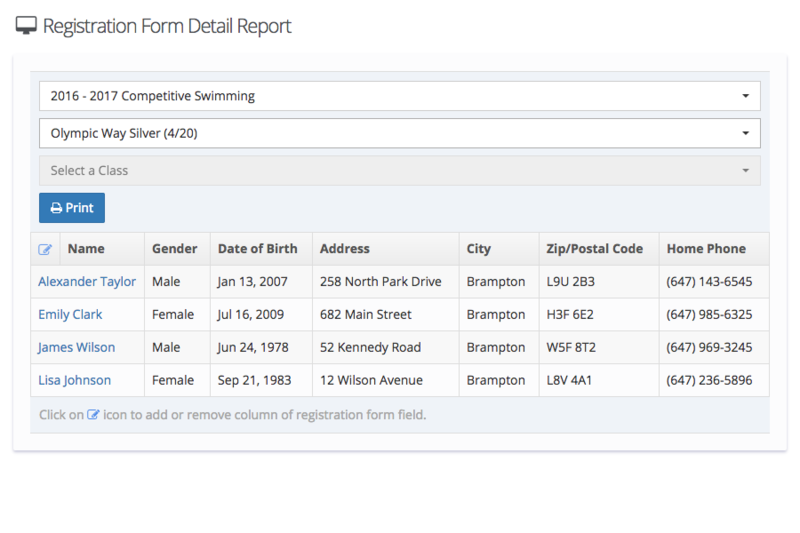 Choose from a variety of different types of reports, from income summaries to participants lists. 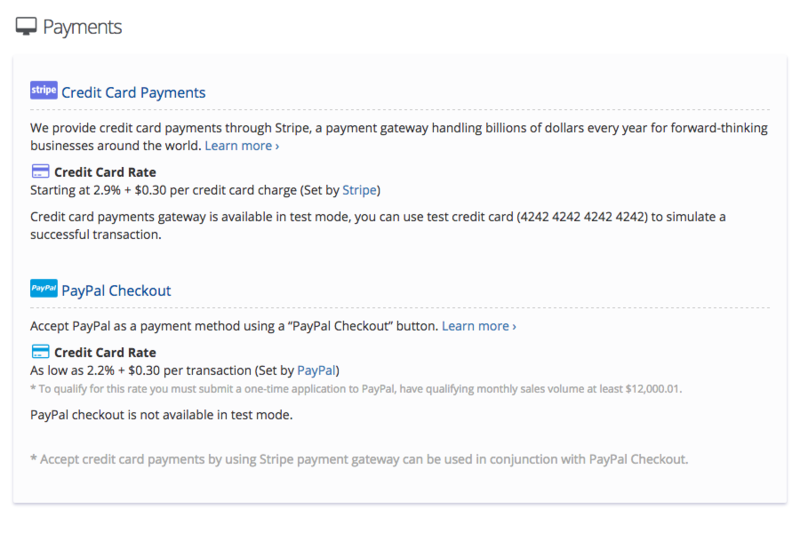 Connect your Stripe account to accept credit card payments online. 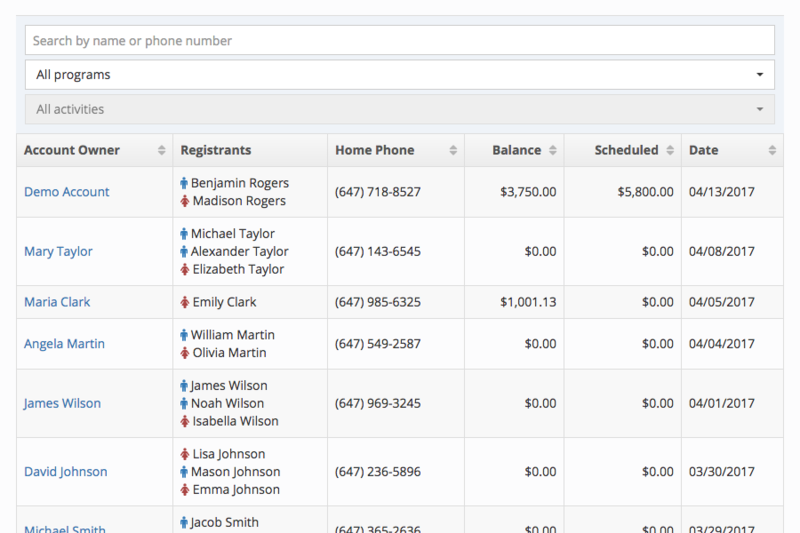 All billing transactions are listed for each client. 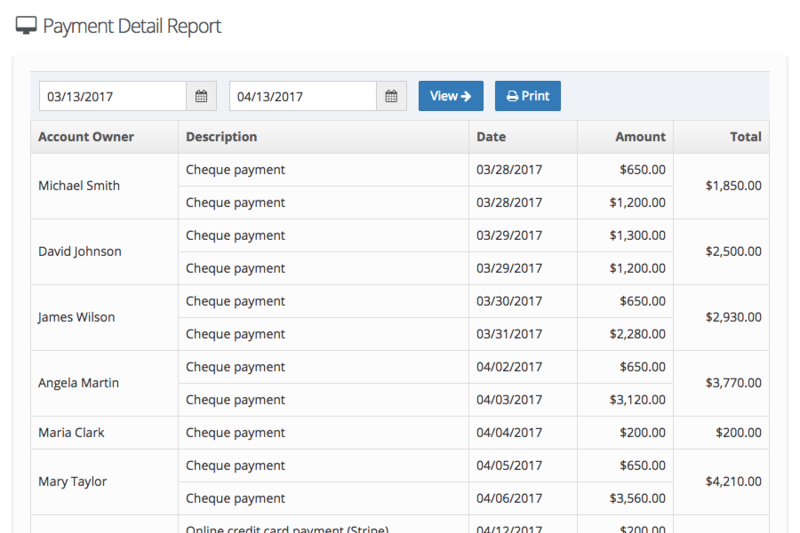 Easily view and manage unpaid orders and installment payments. How can I save 90%? 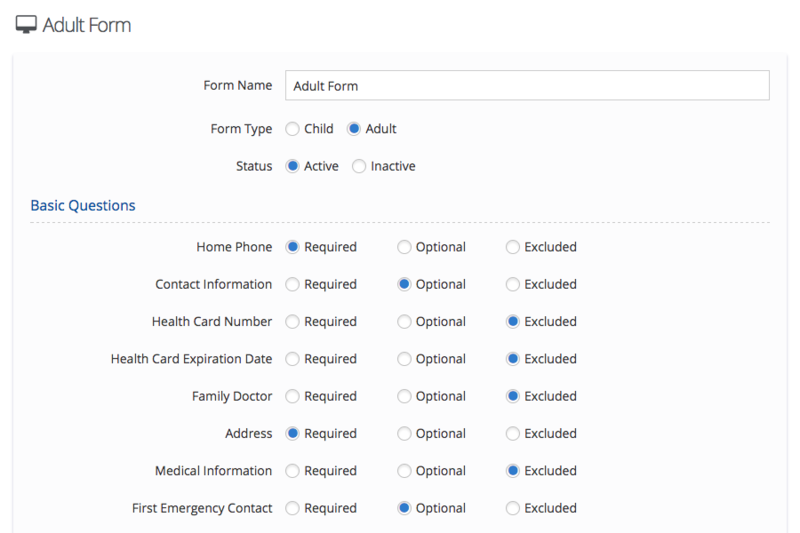 Online registration services provide ease and convenience. But with credit card fees reducing revenue by 3%, it's a high price to pay. 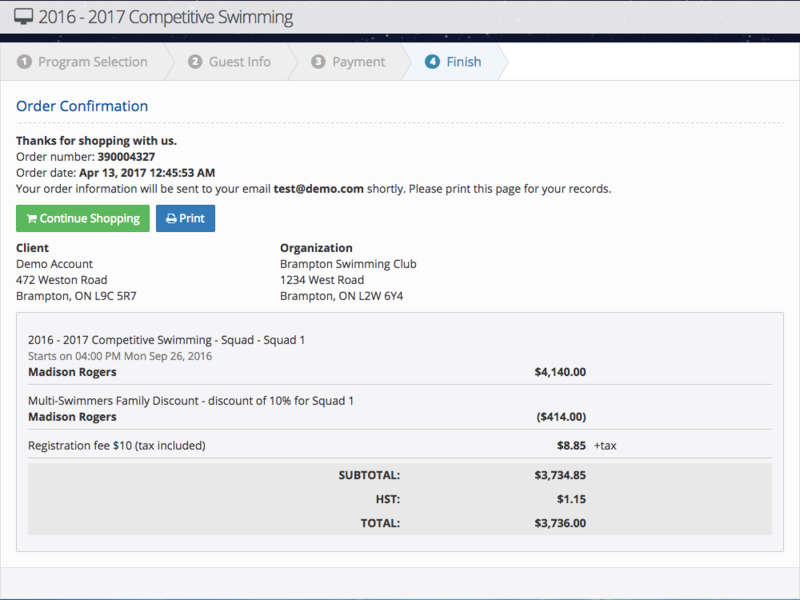 We designed ClubClouds to provide the online registration system you want at one-tenth of the cost. Our revolutionary solution: deposits. By requesting clients to pay a deposit (example: 10%) instead of the full amount, you reduce the amount that is paid through credit card online, decreasing your credit card fees by 90%. 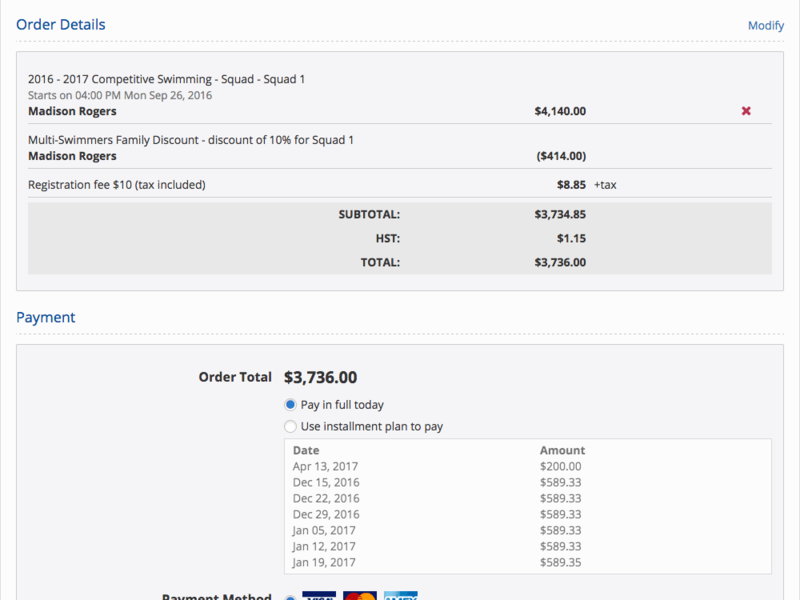 Full online payments come with significant credit card fees. Offline payments may result in high cancellation rates since clients are not bound to the activities they've registered for. By requiring a deposit, it keeps credit card fees low (example: 0.3% of revenue instead of 3%) and ensures that those who register are committed to attending. If you want to provide online registration services at a fraction of the cost, our deposit system is the revolutionary solution you've been waiting for.